This ring holder organizer by Angelynn's is a great way to de-clutter you jewelry box. Using our handmade high quality jewelry organizers and storage solutions you can finally get your jewelry organized! 100% Made in the USA.. Made with US Carbon Steel no mystery metals, tin or lead, and only using the very best baked on powder-coat finishes. It will last a lifetime with proper use. The Susan Ring Display is for girls, teens, women and men of all ages. Many find it best to create a plan, take inventory of what they actually have, and then purchase what they need. Select the Angelynn's link at the top of the page to see our Amazon Store where we have our entire collection of earring holders, necklace display stands, jewelry racks and more. We are here to help you get and keep your jewelry beautifully displayed, up and out of harm's way, seen at a glance and tangle free. Ring Holder Display Measures: 2 1/2 inches tall x 8 1/4 inches wide x 2 1/2 inches deep. Jewelry organizers that are handmade in the USA using commercial retail grade, durable, sturdy, high quality US Carbon Steel (Metal) with a baked on powder-coat finish. This ring holder fits inside all our accessory trays that are on our wall mounted jewelry organizers, but can also be used as a stand alone ring display on a shelf, vanity or dresser or jewelry counter. It has quality felt pads to help protect your furniture. 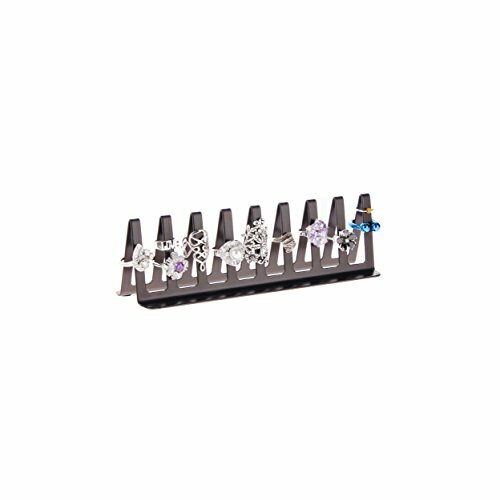 Ring Organizer (Cone Type) Capacity: Displays a minimum of 9 rings from tiny size 1 (1/2 inch diameter) up to extra large size 15 (1 inch diameter). This ring holder holds all round rings in these sizes, including body jewelry rings. How to use: You can double or triple capacity by putting larger rings on first so that will rest on the bottom part of cone/arch and then tier smaller rings on up to the top of the cone/arch. The cone/arches are well spaced so rings should not interfere with one another. If you have any questions about this product by Angelynn's, contact us by completing and submitting the form below. If you are looking for a specif part number, please include it with your message.